There are countless ways to promote your blog content, but most of them are incredibly time-consuming. While reaching out to influencers or earning backlinks are both superior tactics, marketers rarely have the time to complete these tasks. With Facebook Audience Network now reaching over 1 billion people every month, the social media platform is increasingly popular among marketers. And there’s a good reason for it: Facebook’s highly specific audience-targeting allows you to reach just the right people at the right time. Cost-per-click prices are low compared to other paid channels. Targeting options let you reach many potential buyers. Paid promotion expands the post’s organic reach. Promotions are easy to set up and manage. 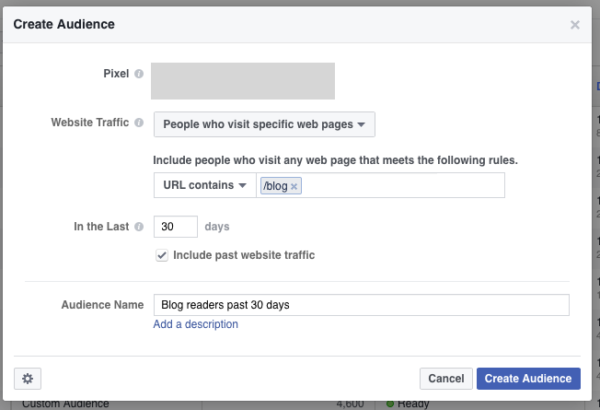 As you explore the value of Facebook content paid promotion, learn about nine best practices that help your content get more clicks at a lower cost. The best way to start promoting your content on Facebook is free. 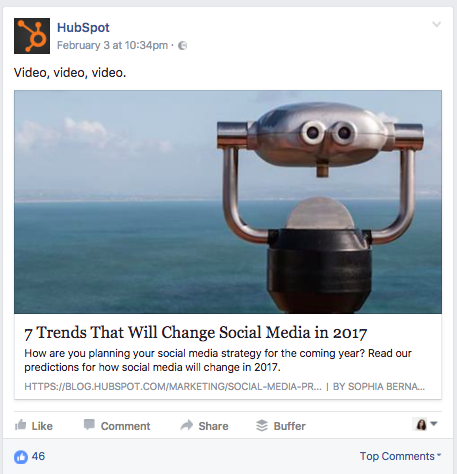 Post a link to the article on your brand’s Facebook page. You can easily do it by copying your article’s URL to Facebook’s sharing box. The post will organically reach about 2% of the people who “like” your page. But that 2% isn’t the main reason that makes sharing posts on Facebook worthwhile. The success of your paid Facebook campaigns depends on its credibility – do people believe that the content is good enough to click on? One of the best ways to prep your Facebook post for a promotional-boosted campaign is to get some “likes” and shares to prove its worth. When your target audience notices that others have “liked” and shared your post, they’ll be curious to find out more, and maybe even share it. To get the first “likes” and shares under the post that you’re going to boost, ask your team members for help. Right after publishing the post, send the link to your team, and ask everyone to “like” & share it with their friends. This way, your post will get its first “likes” needed to improve the Facebook ad’s click-through rate. After you’ve collected five to 10 “likes” for your article’s Facebook post, move on to step two – boosting your Facebook post. 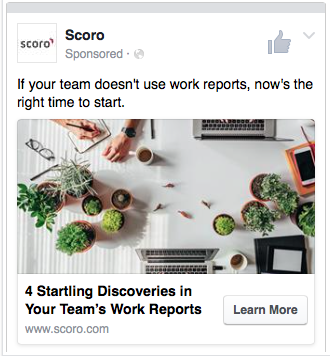 In my experience, the best time to boost a Facebook post is about an hour after publishing the original article. Set the paid campaign duration for one day and use a low budget. You’ll first want to see how the campaign performs before considering an increase in budget or time frame. Cost per click: See how expensive it is to have a person click on your promoted post. 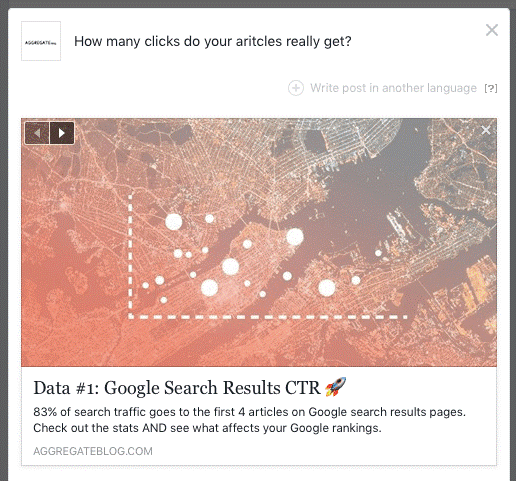 Click-through rate: Evaluate how well your promoted post generates interest from your targeted audience. Cost per mil: Understand how much it costs for your boosted post to be seen 1,000 times. If you’re happy with your campaign results, you can extend its budget and reach. If you’re not, take a step back to evaluate the post itself. According to Copyblogger, 80% of readers never make it past an article’s headline. The same rule applies on Facebook: If your headline fails to catch people’s attention, they won’t click on your ad. Clearly show the benefit to the reader. Include numbers and facts to increase credibility. Keep your headlines short (40-70 characters). Use action verbs such as get, learn, or do. Another crucial aspect people consider when looking at your Facebook ads is the image. Of course you should avoid stock photos, especially the free stuff, as people tire of seeing ads with the same visuals over and over. Use your in-house designer, hire one, or create your images through Facebook-focused ad-tool companies. Tip: To get your ad noticed in an overcrowded news feed, use images with high-color contrast. 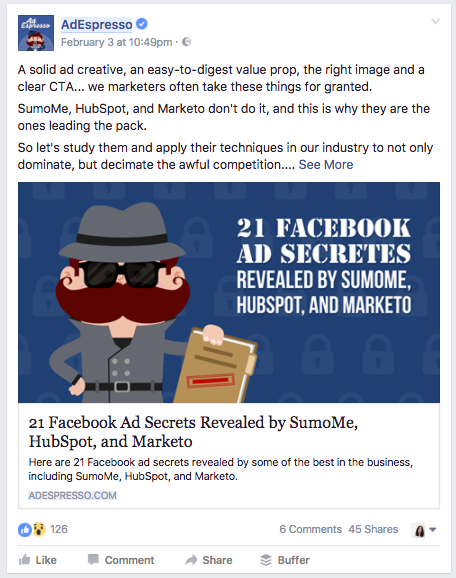 Let’s imagine that you’ve written a magnetic Facebook post headline and found an awesome ad image. However, there’s still a high likelihood that people won’t click on your ad. Use testimonials and facts to increase credibility. Ask questions to captivate people’s attention. Use clear calls to action to show the next step. Play on people’s emotions and ignite curiosity. 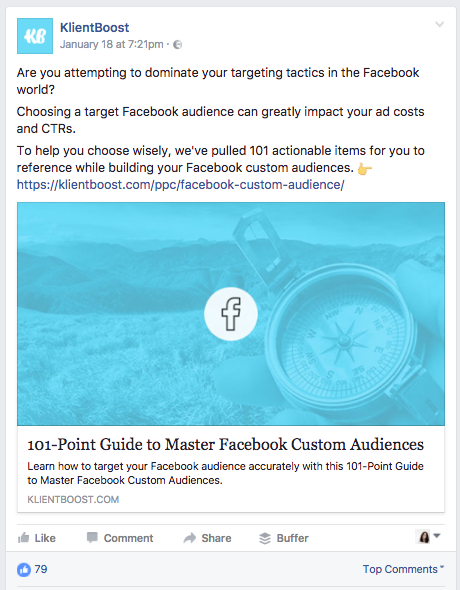 This Facebook post by KlientBoost follows all the best practices: It just makes you want to click and read the article. If you’re unsure which type of headline, image, or ad copy works best, there’s an easy way to find out. By creating a Facebook ad A/B test, you can compare the results of multiple ad versions and optimize your campaign accordingly. A study of 37,259 Facebook ads found that most companies only have a single ad in their galleries. Using a single ad doesn’t allow you to customize for your audience, discover what headlines work better, what ad images you should use more, etc. The more A/B testing you do, the less you spend on ads with little or no potential. 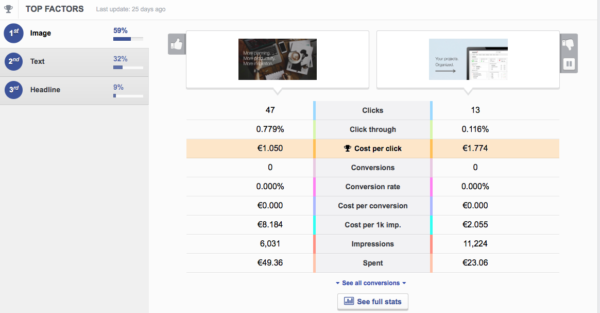 To set up a split test in a few minutes, use Facebook Ads Manager or a tool like AdEspresso. You’ll be surprised what you’re able to discover after running a few successful tests. TIP: To ensure that the A/B results are statistically relevant, you need at least 200 clicks (500 clicks are even more helpful) before deciding which ad variation performs the best. Define your audience to target only people who are likely interested in the article you’re promoting. Audience selection also can affect the cost per click. 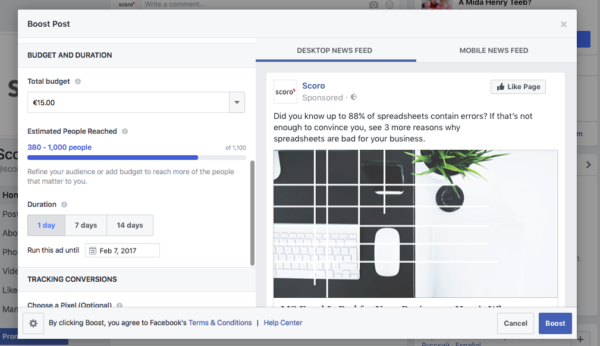 TIP: When promoting articles on Facebook, I like to keep the target audiences narrowed to less than 20,000 people to have more control over the ad delivery. 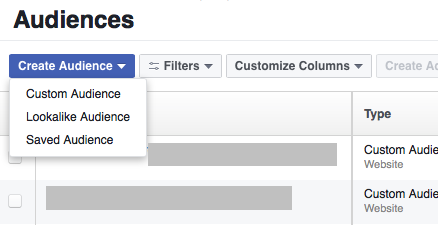 Facebook’s Custom Audience feature allows you to target people who have visited your website or engaged with your Facebook page. They’re often the most valuable audience to target. For example, if you want to target all the people who’ve visited your blog, you can target the URLs for your blog’s domain. TIP: Create custom audiences of people who have read specific topics on your blog to easily advertise your new content on that topic to them. We recently ran a small test with Scoro to see whether emojis have any effect on Facebook posts’ click-through and engagement rates. Full disclosure: We didn’t have 10,000-plus impressions or a sufficient amount of clicks to say this A/B test is 100% statistically significant. Consider it a fun test to replicate. We discovered that the ad with the red-flag emoji in the headline had the click-through rate of 0.846%, while the ad with no emoji had the CTR of 0.351%. TIP: If you aren’t up on the latest emjois, use Emojipedia to help find the right one for your headline. You can copy and paste from its text-editing box. Promoting articles on Facebook is simple and can have a high return on investment. Don’t worry if it seems confusing at first. After you’ve set up a few campaigns, it’ll be like child’s play. Share the post first on your Facebook Page. 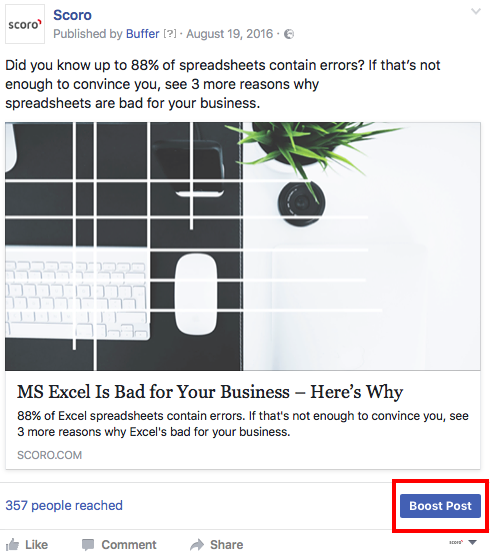 Create a boosted Facebook post. Create A/B tests to see what works. Use the Custom Audience feature. 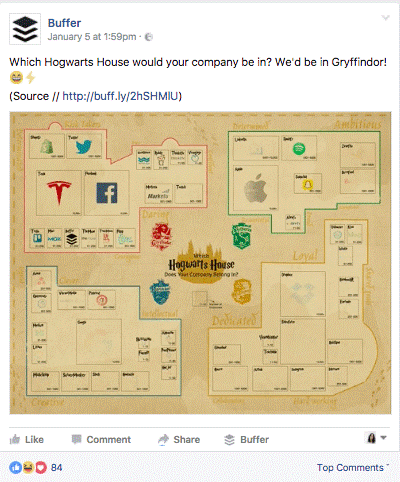 Add emojis to your Facebook ad copy. Have any questions about Facebook ads and blog promotions? Leave a comment and let’s find the answer. Want to grow your social media skills and much more? Make plans today to attend Content Marketing World Sept. 5-8 in Cleveland, Ohio. Use code BLOG100 to save $100. 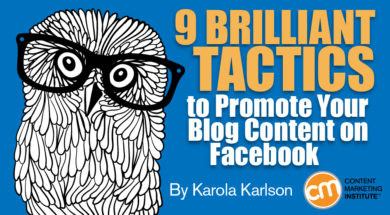 Karola Karlson is the founder & author of Aggregate, the most upright blog about marketing, growth, and data. She’s also a contributor to marketing blogs like AdEspresso, HubSpot, and KlientBoost, and works as the Digital Marketing Manager at SaaS startup Scoro. Karola’s all about random cool ideas, growth marketing, and taking new marketing approaches on a test drive. Connect with her by visiting her blog or on Twitter @KarolaKarlson.